Georgia State senior Ryan Blanton is the epitome of a top-notch student-athlete. 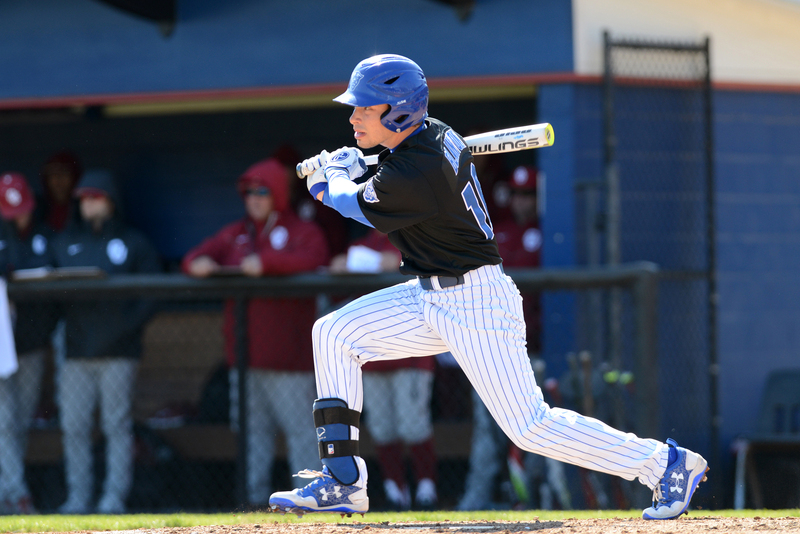 As one of the more prominent leaders of the Georgia State Panthers baseball team, Blanton has created an impressive reputation for himself off of the field, particularly in the classroom, where he has garnered many accolades. But for now, let’s dive into his career as a Panther baseball player. Since joining the team in 2014, Blanton proved to be a pivotal piece to the Panthers’ organization. He has developed a work ethic that has allowed him to produce at a high level, year in and year out. According to Blanton, the hard work begins in the offseason. Along with his offseason regimen, Blanton also has a mentality that allows him to excel at what he does. That mindset includes not even contemplating on the idea of having an All-Sun Belt Conference season, like the one he celebrated in 2015. Blanton later said that after his freshman year, he focused on working on being a more consistent player, and realized to do so, he had to work consistently and have a steady and stable mindset. To help cope with the psychological dimension of the game, Blanton did what other players may not have done; he took the time to read and understand how he could control his thoughts under certain circumstances. “It was prescribed by our hitting coach (Adam Pavkovich),” Blanton said, who the team refers to as Coach Pak. According to Blanton, Coach Pak talks a lot about the mental aspect of the game. Blanton’s work ethic and his ability to stay mentally focused throughout the duration of a season has proved to be advantageous to his success. In fact, Blanton is currently leading the team in slugging percentages (.494), runs scored (16), hits (25), RBI’s (18), triples (2) and home runs (4). Blanton said there’s no unorthodox preparation for his on-field success. It’s also no secret that Blanton has enjoyed his career as a baseball player at Georgia State. When asked about his experience as a Panther baseball player, Blanton used the word love very loosely. In regards to Blanton possibly playing baseball in the major leagues, he didn’t hesitate to say he would obviously love the one-in-a-million opportunity to play professionally, while also hinting at the fact that that dream may or may not come true. Many athletes become so heavily engaged in their dreams of becoming a professional athlete that they fail to formulate a sufficient plan B. For Blanton, it was in high school where he began to consider what would be his backup plan if he wasn’t lucky enough to live out his dream of becoming an MLB player. With encouragement from his parents, Blanton is currently pursuing a career in the medical field. “If the draft doesn’t work out for me, and I have to continue to go to school, I’m gonna try to go to [medical] school to be a doctor,” he said. However, Blanton doesn’t stop there with his backup plans. He even has a plan C, which he says would be physical therapy or cardiac physiology. Last summer, Blanton had the unique opportunity to shadow a doctor in Rhode Island. He considered the experience to be very insightful. It all became evident: whether it’s playing baseball or becoming a doctor, Blanton has a promising future.